Depending on the severity of your acne and on your past treatments, Pacific Plastic Surgery may have the perfect treatment option for you and your acne. We use topical prescription grade products, chemical peels, and two different lasers to help treat either active acne or acne scars. Ideal for combination, oily and acne prone skin. Works to promote the skin’s natural renewal process to aid in the reduction of acne and to improve uneven texture, blotchiness and uneven skin tone. IPL (Intense Pulse Light) is combined with a topical solution called Levulan in a procedure known as Photodynamic Therapy. Photodynamic therapy is used to treat mild to moderately severe acne. The Levulan inactivates the bacteria on the skin that can cause acne. It also reduces the sebaceous (oil) glands in the skin, helps exfoliate the skin and unclog the pores. It is ideal for the person that has tried other topical or oral acne treatments with minimal success. During the treatment,the Levulan solution is applied to the skin and left in place for 2-3 hours.The Levulan is then activated by the broad spectrum light of the IPL. The skin will be sensitive to sunlight for 48 hours. It will be red and swollen for a few days and there may be some light peeling. Your skin will return to normal within a week’s time. The treatment can have a long lasting beneficial effect on either active acne, or altered pigmentation that has resulted from healed acne. 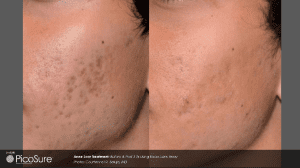 The PicoSure laser is a breakthrough, FDA-approved treatment for acne scarring. The PicoSure Focus Skin Revitalization treatment rejuvenates the skin and reduces acne scars. It is a safe treatment that creates a photomechanical impact to remove damaged layers of the skin without harming the healthy skin around it. The laser helps stimulate collagen production and produces new skin cells in the underlying layers to give scar-free skin. In each session, layer by layer of damaged skin is removed to reveal healthy skin underneath. The laser is done once every 2-4 weeks for 2-3 sessions. The session itself is relatively pain free. You are given anesthetic cream as well as a cooling fan for increased comfort. The laser feels like a warm prickly heat and takes about 30 minutes or less to complete. You skin will be red that day, but otherwise there is minimal downtime. It is important to wear sunscreen and to limit sun exposure before and during your treatment sessions. Please contact us at (805) 898-0700 for a consultation to find out which treatment option would be best for you.